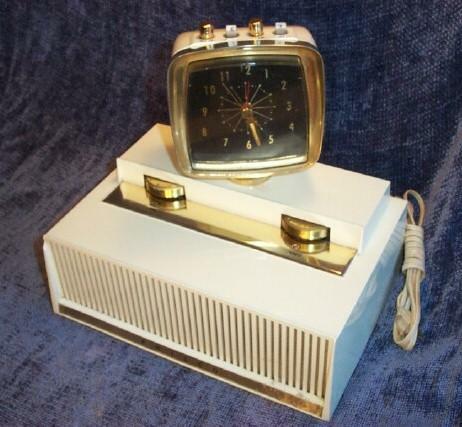 This beautiful radio is styled after the famous Philco "Predicta" television set. Black faced clock with gold numbers, hands, pushbuttons and trim swivels above an ivory base accented with plenty of gold trim and gold knobs. Very clean and polished. Clock has been lubricated and works and the hands glow in the dark! The radio has been serviced and works very strongly with good tone. Two pushbuttons missing but all functions work fine. Small ding in left upper corner. Five tubes, BC only, AC, 11"W x 11H" x 7"D.
You are visitor number 6,339 to this page.